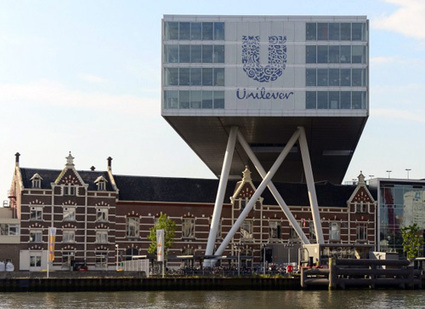 In the late 1980s, as part of Kei Abe’s MTJ team, I went to Unilever facilities in the Netherlands, Italy, the UK, and the US to help them implement what had yet to be called “Lean.” Unilever was impressive as an organization in that, in markets including detergents, processed foods, mass-market toiletries and prestige cosmetics, they were afraid of nobody, anywhere. They knew how to adapt their products to local tastes in 130 countries — down to package dimensions — and how to integrate a multinational, multicultural work force. A production supervisor we were working with in Italy was a 25-year old German engineer, and the executive sponsoring our engagement at corporate headquarters in the Netherlands was from India. Of course, the factories offered plenty of opportunities. Their processes started with chemical operations producing bulk, followed by filling and packaging operations producing discrete units at takt times that were often a fraction of a second, and then aggregating these units into display cases, boxes, pallets, and truckloads. Our recommendations were to start with projects that would accelerate and smooth the flow from start to finish. Eventually, they went with TPM first, which we felt was not a good starting point, because it requires involving the entire work force and, if not correctly understood, can lead to local improvements that do not necessarily translate into improvements for the plant as a whole, which this article says actually occurred. The article gives a sense of Unilever’s journey since then, as long as you ignore the confusing alphabet soup of improvement programs. The term World Class Manufacturing (WCM) is described as having been coined in 2007, when in fact it is the title of a 1987 book by Richard Schonberger. And the descriptions of TPM, Lean, and Six Sigma are bewildering. TPM is an approach to maintenance, and there is more to operating a process plant than maintenance. Unilever, and other companies in process industries, have responded by making TPM an umbrella program, under which they lumped all sorts of activities unrelated to maintenance. While it looks strange to outsiders, who is to argue with it if it works? In the 1980s and 90s, the “World Class Manufacturing” brand had currency, until it was eclipsed by “Lean.” 20 years later, it was revived by Yamashina and Fiat. Unlike TPM, it suggests a comprehensive approach to manufacturing, but what is “world class” today may not be tomorrow and it is a label under which content may change.